Did newly-elected Austrian Chancellor Sebastian Kurz eject George Soros’s foundations from the country? And is Kurz a 9/11 truther who was “red pilled” by watching Loose Change? Those claims were made last month in a YourNewsWire.com story headlined “Youngest World Leader Bans George Soros’s Foundations From Austria.” But the claims are false. It’s fake news. Does that mean we should trust PolitiFact, the site that debunked the story? Not really. 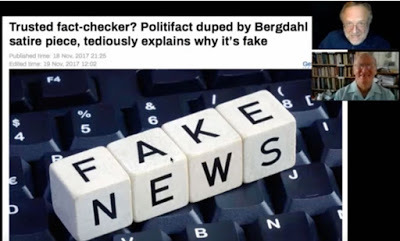 PolitiFact recently “debunked” an obviously satirical story on Bowie Bergdahl wandering out of his court martial. This show was broadcast on November 22, 2017. This entry was posted on Tuesday, November 21st, 2017 at 9:47 am	and is filed under Anti-War, Censorship-Propaganda, Education, False Flag/Fake Terror, Freedom, Geopolitics, Human Rights, Immigration, Justice, Kevin Barrett, Law, News, Politics, Protest. You can follow any responses to this entry through the RSS 2.0 feed.